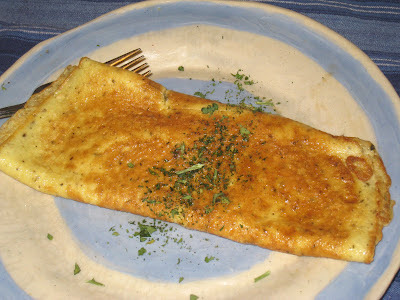 I mastered the art of the three-egg, goody-filled omelette years ago. It is one of my favorite things to eat for breakfast, but it is quite a production and takes some time. It does not take as much time as a frittata, but you can leave the frittata and do other things while it is cooking, whereas the omelette requires more or less constant attention. In addition, the frittata lasts me a few days, whereas the omelette is gone in one sitting. Because of that, the omelette has become one of those rare Sunday morning meals, made when I have the time, inclination, and ingredients to put the effort required into making it. Back when I was making bread every Saturday, I always ended up with the remains of the egg wash that I used to brush over the top of the loaf before putting it into the oven. Usually I would put it in a little jar to add to whatever eggs I was having for breakfast on Sunday, but there were times when I did not make eggs on Sunday, and that little jar would sit forgotten until I would run into it while looking for something else and would have to dump it. I hated wasting it, so I got in the habit of frying it up in my little skillet right then and there for a mid-afternoon snack. And it was so quick and easy, I decided it might be worthwhile to cook eggs that way on purpose. And thus was born my quick cheese omelette. A pat of butter, two eggs, a little bit of milk or cream, and a sprinkling of cheese make for an almost instant meal. A non-stick pan seals the deal. I threw some dried tarragon into this one, and it was a lovely enhancement. Any dried herbs would be good - thyme, oregano, dill, or a combination. It only needs a little salt and pepper. I have been using up some Swiss cheese I bought to make an onion and bacon tart, but any cheese would do. Or no cheese at all, if you don't have any. Crack two eggs* into a small mixing bowl and add 1 to 2 tablespoons of milk, cream, or even water. Season to taste and add dried herbs, if using. Whisk well, until eggs are totally combined and airy. 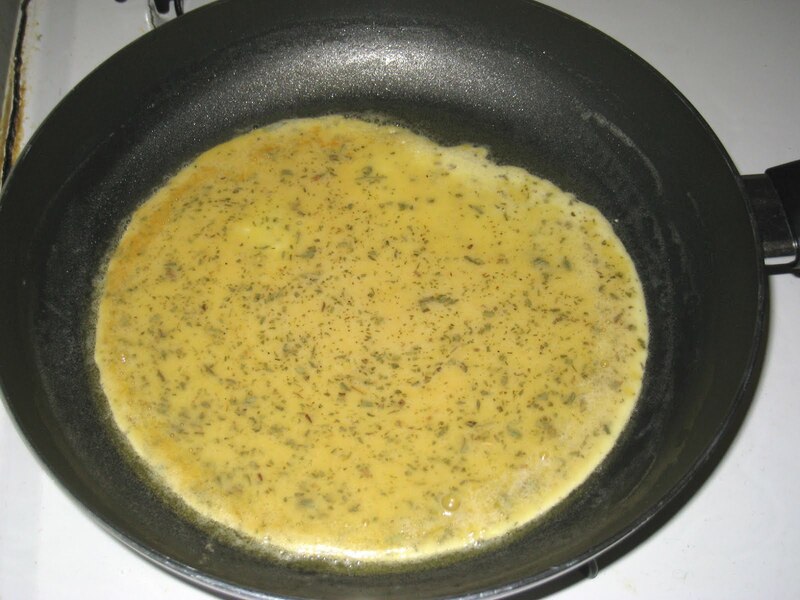 Melt a pat of butter into an 8-inch non-stick skillet over medium high heat. When the butter is foaming, pour the eggs into the skillet, whisking them again as you pour them. Let the eggs sit until the bottom has started to set, about 15 to 30 seconds, and then start to swirl the mixture around the pan so the wet eggs on top continue to be distributed around the heating base. When the eggs are almost set, but still wet on top, sprinkle about 1/8 of a cup of shredded cheese between the center and one edge, and then fold that edge over the cheese. Continue to move the omelette around the pan for about 30 more seconds to give the cheese time to start melting. Remove from the heat and slide the omelette onto a plate, using the skillet to fold the other side of the omelette over the folded side. *It is better if the eggs are at room temperature, but that is not a deal breaker.